I'm really sorry I haven't updated this blog recently but as some you know I had many stuff involved in real life. First was the birth of my lovely daughter that takes a great deal of my attention these days, but also a misfortune of having to move house since my former owner wanted it for herself. So this is the new furniture that I designed and hosts my consoles, TV, WiFi Router, plus some plastic selves for my storage needs (lotsa cabling, adapters, audio stuff, Amiga computers and extra stuff). You can see that behind the TV there's some light. 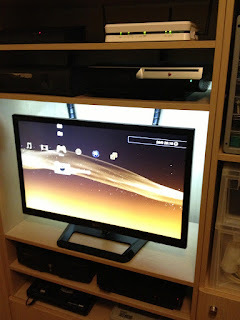 It's nothing more than a White LED strip that I used to lighten a bit the TV from behind for nightly gaming times that without light it was tiring. Of course, the alignment was carefully examined, because I wanted the consoles with Wireless enabled controllers to go above TV (since it's not a problem) and all the other consoles with Wired controllers to go bellow the TV. 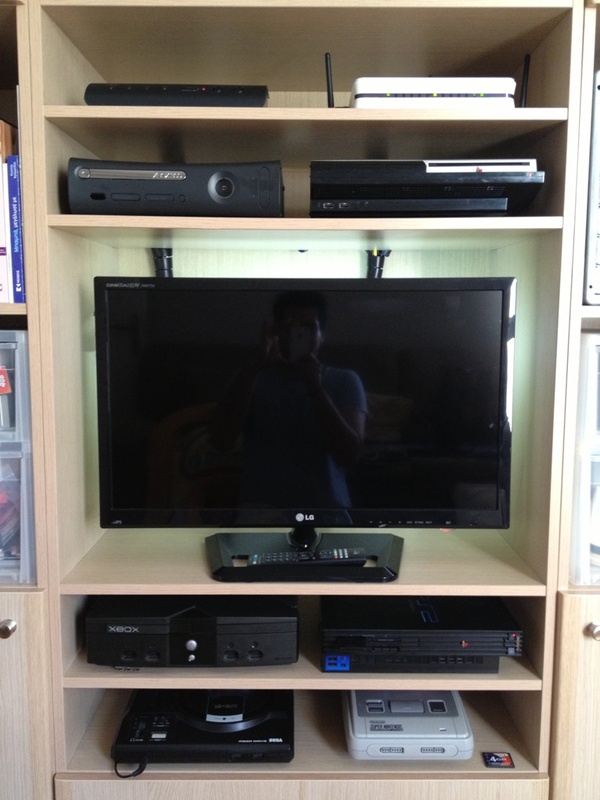 You can imagine it would be a huge fail to have the console with wired controller above the TV having to see a cable while you play! 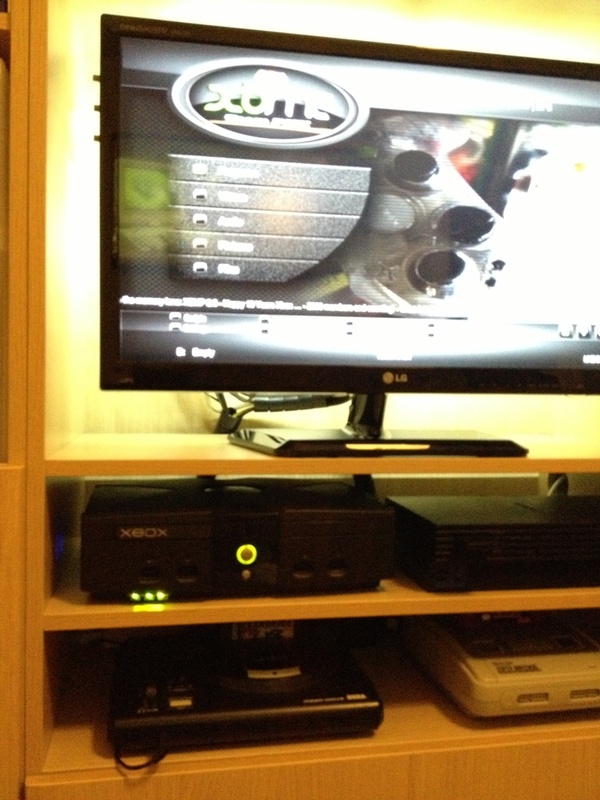 Loaded with Xecuter and working via latest XBMC. 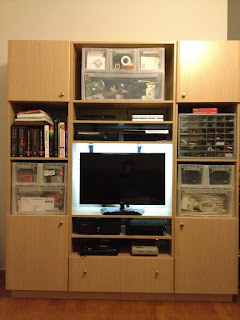 It's connected via Component connection to the LED TV via the Automatic Component switch. 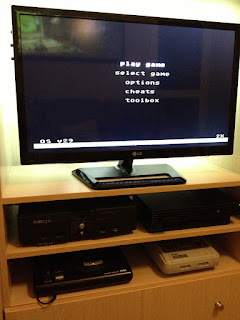 I really enjoy this machine not only for it's games, but also for all the Emulators that it hosts in it's 500GB Hard Drive and mini Media Center capabilities streaming music/videos from my main XBMC PC/Server combo on the living room via SMB. 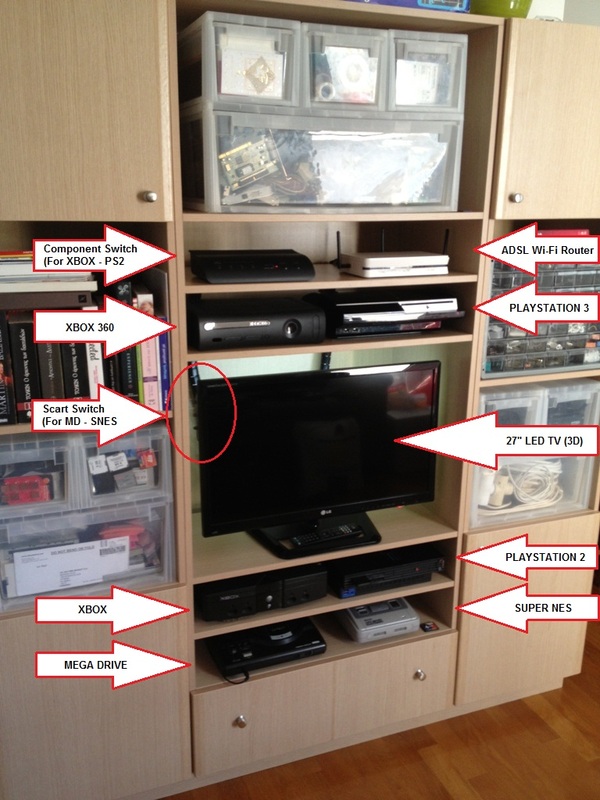 Full of Win! Modded with DMS4 using ToxicOS to load a great deal of games via it's 500GB Hard Drive! 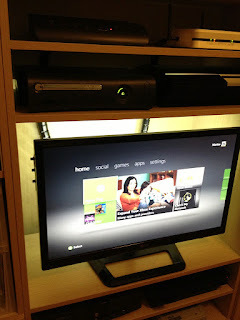 It's connected to my TV via the Component cable and also through the Automatic Component switch along with the XBOX. A gift from my good friend Leo (Keropi) which is modded with switch for PAL/NTSC, switch for 50Hz/60Hz and a custom cable for giving Scart some Stereo output from the headphones socket. 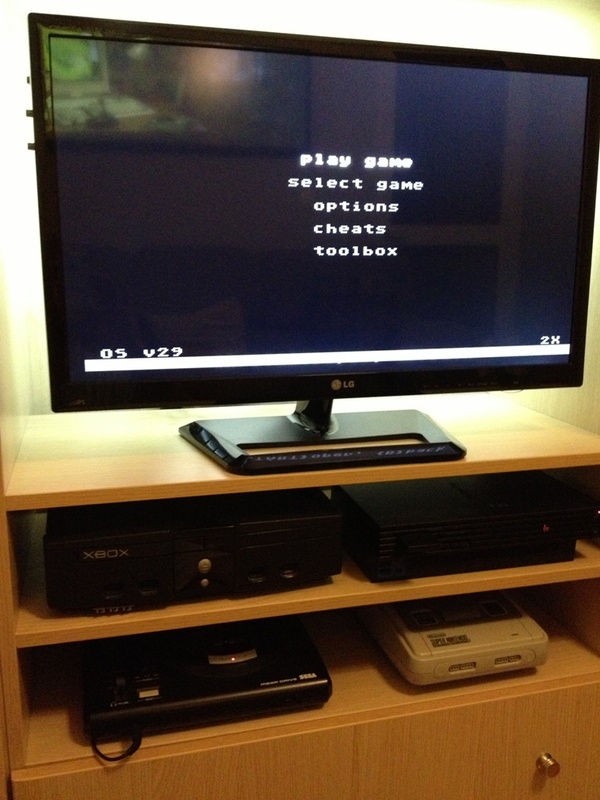 Also it runs it's games from an Everdrive cart using an 2GB SD card. 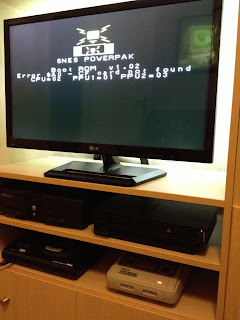 It's connected to the TV via a Scart cable that goes through a manual Switch (since my TV has only one RGB scart socket). This is the latest addition to the collection. It's a modded SNES with SuperCIC (switchless modchip) but ALSO with an IGR (In Game Reset) mod. Ofc it has a dual LED for the IGR change to PAL/NTSC which replaced the original LED (so it looks as original \o/). (Don't be fooled by the following picture. CF card is not attached because whole SNES + Powerpak + CF card exceeds the height of my 13cm shelf for 5mm!!! Don't worry though... Mod will come soon for that, extending the CF socket with a ribbon). This awesome XBOX 360 it's a Jasper JTAG hacked one, running whatever games I want from it's internal 500GB Hard Drive. It supports just fine Kinect etc, but can't run online content (not that I need it tbh). It's connected to my TV via HDMI cable. 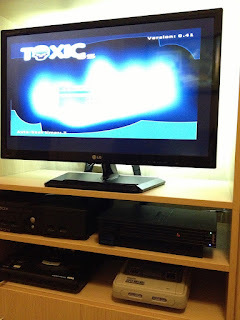 This is an awesome fat PS3 version that was originally bought with DEX firmware version 4.20. It's connected to my TV via an HDMI cable as well.